The Salmonellae belong to the Enterobacteriaciae genus Salmonella. They cause two types of illnesses: gastroenteritis from food poisoning (salmonellosis), and typhoid and paratyphoid fevers. They are Gram negative bacilli which are mobile in all directions because of their flagelli. They are facultative aerobic-anaerobic. They have a genome composed of a chromosome with almost 5 million base pairs coding for approximately 4,500 proteins. 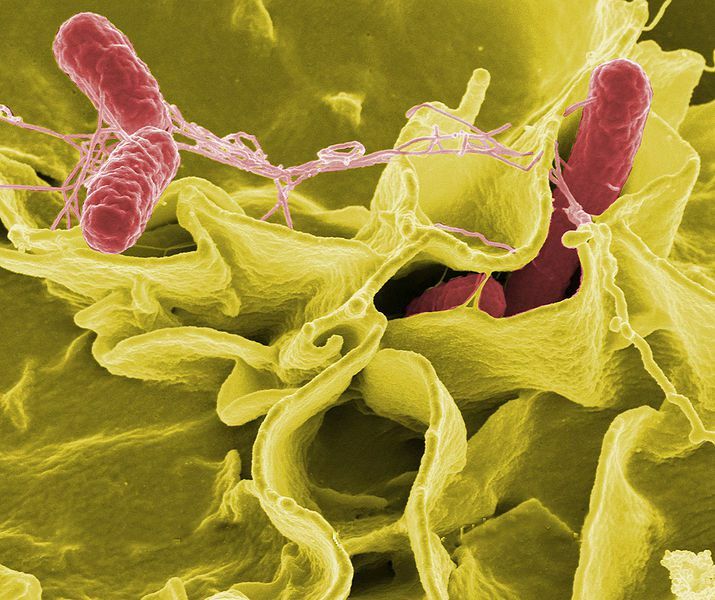 It is now known that there are more than 2,000 species of Salmonellae, although only a minority is responsible for the majority of human salmonelloses. The serotypes Typhimurium and Enteritidis are involved in gastroenteritis whereas the serotypes Typhi and Paratyphi are involved in the febrile diseases. The first group are limited to the gastrointestinal system whereas the second can cross the intestinal barrier, colonising lymphoid tissue. Their pathogenicity is due to endotoxins produced by the salmonellae.